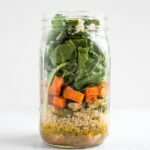 This kale sweet potato lentil salad can be meal prepped two ways: in a mason jar or a meal prep container. 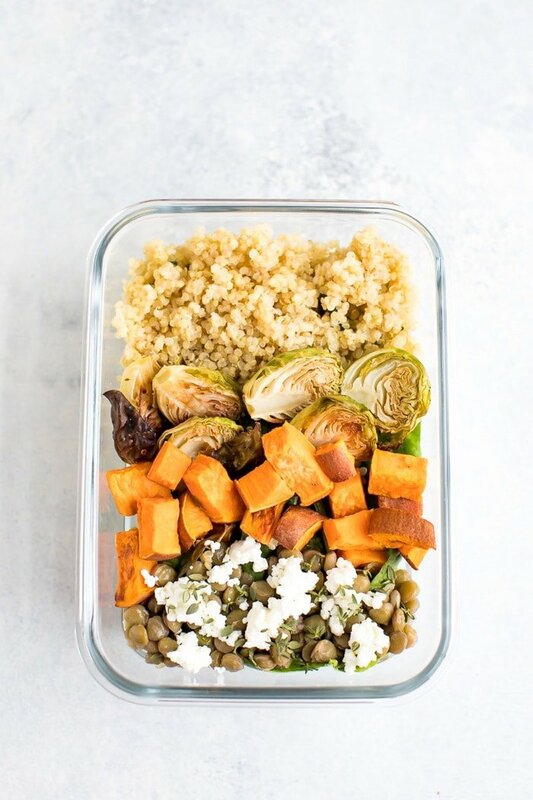 Roasted sweet potato and brussels sprouts give this salad a flavor boost while the lentils and quinoa bring the plant-based protein… over 25 grams! Vegetarian + gluten-free. Can you believe we’re already on day three of salad week? It’s going by SO fast. This salad miiiight be my favorite. So many of my favorite ingredients in one recipe! I’m sure I’ve mentioned it before but I am obsessed with using roasted veggies in my salads. I love when they’re fresh out of the oven and I get a mixture of warm and cold foods in the same bite — but they’re also delicious after being chilled! Roasting is just the best way to prepare vegetables… amiright? The obsession is real. Time saver tip when making this salad: buy the pre-cooked lentils from Trader Joe’s. These are hands down my favorite! They’re steamed, ready to go and so dang delicious. Trader Joe’s also has pre-roasted brussels sprouts and sweet potato wedges, so if you don’t have time to chop and roast the veggies they’d be a great option. You can even buy pre-cooked organic quinoa from TJ’s too. That would make this salad SO freaking easy to toss together. No cooking necessary. 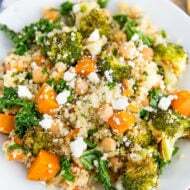 Note: Check out my roundup of quinoa salad recipes. As always, this recipe can easily be adjusted to make it work for YOU! 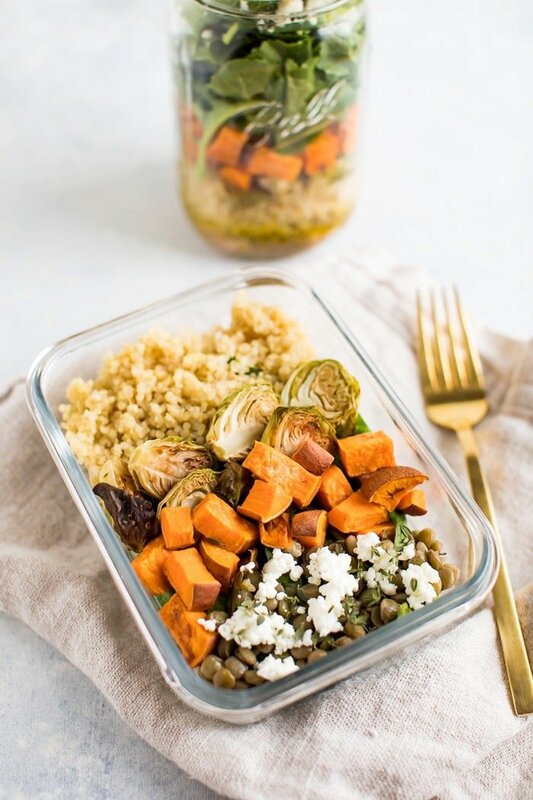 Quinoa can be swapped for any other grain, and you can roast any veggies you love or have on hand (squash would be divine in this!) and use your favorite greens. 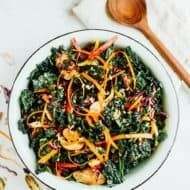 Baby kale, spinach or mixed greens will work beautifully. 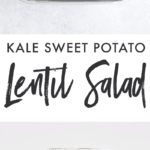 I should also mention that this sweet potato lentil salad uses the same red wine vinaigrette dressing used in the chicken avocado club salad, so if you already made the dressing for that salad earlier this week and have leftovers, you’re golden! Spread chopped sweet potatoes and brussels sprouts on a baking sheet with 1 teaspoon of oil, sea salt and pepper. Toss and then roast for about 20 minutes or until tender. If they aren’t pre-cooked, cook your lentils and quinoa according to package directions. 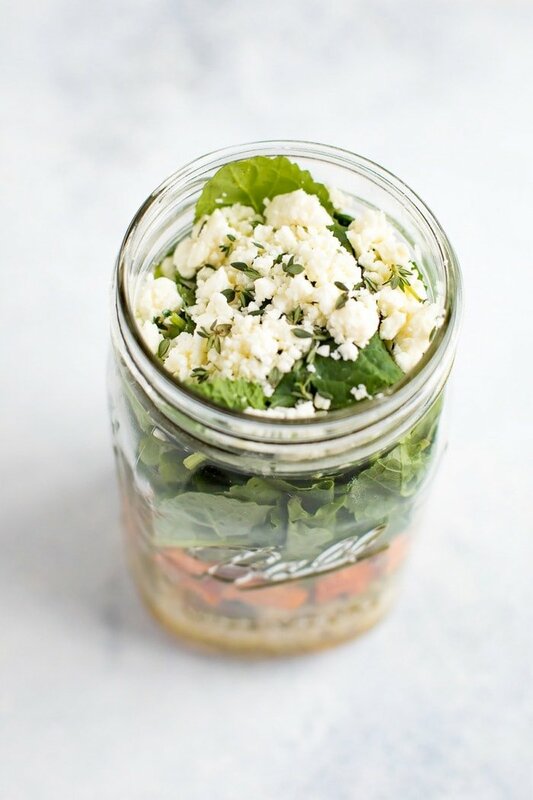 Make the dressing by whisking together all the ingredients in a small bowl or glass jar. 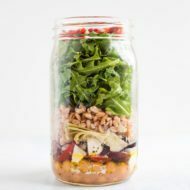 For a mason jar: Add 2-3 Tablespoons of dressing into a large, wide-mouth mason jar, then start layering ingredients in this order: lentils, quinoa, brussels sprouts, sweet potatoes, kale, feta, thyme. 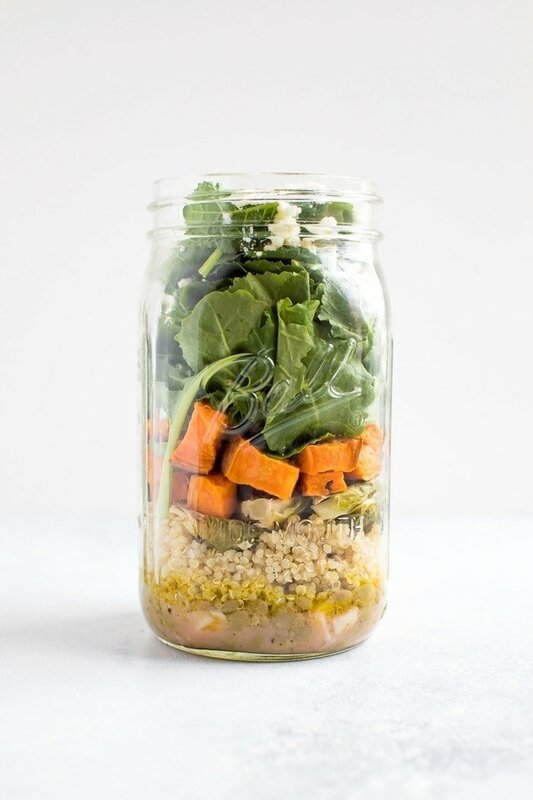 For a meal prep container: Line bottom of container with kale and layer all ingredients in columns/sections on top. Store dressing in a separate container. * Feel free to roast additional sweet potatoes and brussels sprouts beyond what the recipe calls for. That way you’ll have extras on hand for additional salads or other uses. You can absolutely meal prep more than one salad at a time. Just double, triple or quadruple all the ingredients except the dressing. The dressing already makes about 4-5 servings. All of my favorite foods combined into one salad! 🙂 I’ve definitely really been enjoying adding roasted vegetables to salads lately. Can’t wait to try this salad, bought all of the ingredients and putting it together tonight!! Do you happen to know how long the lentils from Trader Joe’s last once opened? 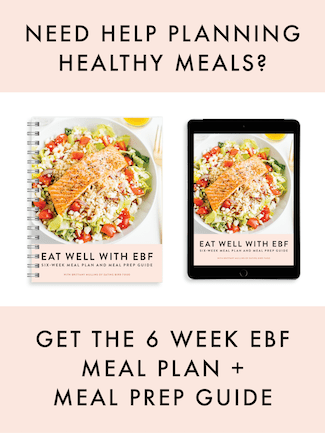 Trying to meal plan with a couple of your salads (Thank you for so many options!! ), and just want to know how fast to eat these up. Hi Andee! I’m not sure if it it says anything on the package but I would try to use the cooked lentils in 2-5 days after opening if you keep them in a sealed storage container in the fridge. You’ll know if they’ve gone bad because they’ll likely be slimey and smell awful. Delicious! I managed to forget to buy salad greens so rather than go back to the store I made this as a grain bowl instead of a salad. This will be going in my regular lunch rotation. Oh!! I bet it was just as tasty as a grain bowl. So glad you enjoyed it, Melissa.